When I signed the lease on my first apartment out of college, I was instantly filled with a wave of excitement at the prospect of decorating my place with my future roommate. I confess: I was obsessed (and still am) with home décor. I had West Elm dreams on an IKEA budget. After leaving cramped dorm life, I embraced a newfound freedom to decorate my big-girl apartment as I pleased. However, now on my third apartment, I’ve come to realize that it wasn’t necessary for me to spend a ton of money on cute artwork and pricey knickknacks for my place. I got by just fine with a combination of pieces from Target, HomeGoods, Bed Bath & Beyond, and yes, IKEA — the majority of which I still use today. I can put more time and effort into my place when I’m older, but for now, I’d rather invest my money and spend it wisely on things that really matter to me, rather than splurging on a marble coffee table worth a third of my rent. 1. Cheaper items can last a few years, as long as you take good care of them. Don’t let your friend convince you that the wooden desk you’re considering buying off of Facebook Marketplace will fall apart before your lease is up. With a little TLC, and perhaps some paint and refurbishing, your items can feel like expensive pieces that will last. Take pride in your belongings and make the most of them. A bed frame $100 more than the one you were planning to buy won’t add significant happiness to your life, so you might as well make do with furniture that fits into your budget. Most of your friends are likely in the same boat, so there’s no shame in holding onto older furniture for much of your 20s. 2. These items are temporary. You’ll likely start fresh once you’re settled down. Don’t feel like you need to get a whole new dish set once you see a few nicks or cracks in your plates. You can hold out for a nicer set when you have the budget for it — and if you get married, you may even have a registry and get a nice new set that will last you years. And so what if your hand-me-down couch doesn’t match the rest of your living room furniture? You can spruce it up with cheap throw pillows or a blanket to give the room more of a cohesive flow. 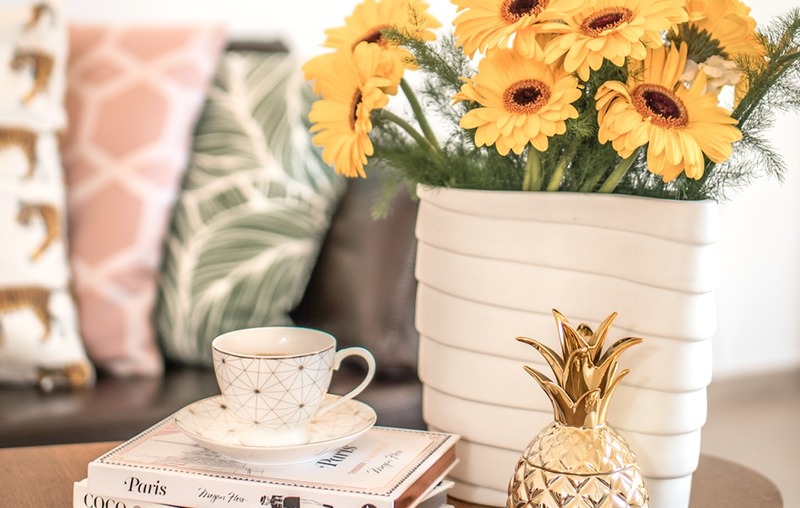 Sure, you might not be 100% happy with the appearance of every item in your apartment, but once you leave your old roommates behind and eventually get married, you’ll have more stylistic and financial freedom to decorate your place exactly how you want it. 3. Your style will change. Are you regretting that millennial pink sheet set you bought at 22? Is your style more minimal now, but your current space feels chaotic because of the art pieces you’ve collected over the years? When furnishing your first apartment, a good rule of thumb is that simplicity is generally the way to go. If you buy furniture pieces that are super trendy or have a crazy color scheme, it will be hard to fight the urge to spend the money replacing all of them three years down the road. Don’t be afraid to go a little basic, especially because your roommates will change over the years, and you want to have common area pieces that most people will like. That doesn’t mean you need to cramp your style completely, however; you can still embrace décor that you enjoy, but just know that functionality and practicality are the way to go when it comes to shared apartment living. 4. Your furniture is bound to get banged up during your moves. Whether you hire a few friends to lug items into a UHAUL or call a professional moving company, it’s nearly impossible to avoid getting some scratches in your furniture as it’s being lugged up the stairs of your new apartment building. Thus, there’s no need to invest your savings into a gorgeous dining room set right now, because you’ll be devastated if it gets dinged up. Especially since these pieces are temporary, there’s no need to become emotionally attached to them. The cheat code? Get a wood pen to cover up those obvious marks in your wooden furniture, and it’ll look good as new! 5. With new roommates comes a cycling of used furniture pieces. As you move over the years, you’ll run into a number of unexpected situations that might make you happy that you didn’t invest in expensive furniture for apartment #1. Perhaps you’re moving in with a new roommate who already has a couch, and now you have to figure out what to do with your couch from your old place. If you don’t live near your parents who could store it, you might have to consider selling it, in which case it’s now depreciated in value and so you’ll lose a little money from when you first bought it. Plus with each new apartment, you’ll almost always need to spend a little money furnishing it. For example, perhaps in your first place you bought everything for your bathroom, whereas your old roommate bought the kitchen supplies. In your new place, you might need to buy new kitchen items if that previous roommate kept them. 6. You can recycle many items from college. If you’re living in a big city like New York, San Francisco or Los Angeles, your new place likely isn’t much larger than your college apartment — it might even be smaller. Thus, all of those organization pieces you used for your dorm, like an over-the-door shoe rack, under-the-bed bins, and bathroom storage can breathe new life in your post-grad apartment. Sure, you’ll need to get rid of that Twin XL bedding, but don’t toss everything you once owned! You don’t want your new place to look like a college dorm, but you surely have a few key pieces that would work seamlessly in a tiny apartment. Mara Hyman is a Boston-based writer and marketing professional who is passionate about all things career and lifestyle. Follow her on Twitter @marahyman for more!